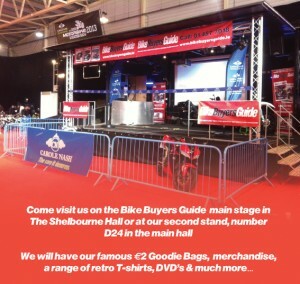 The March 2015 issue of Bike Buyers Guide is in shops from today and it’s a bumper special edition featuring an official Carole Nash Irish Motorbike and Scooter Show pull-out programme celebrating the bi-annual bash in the RDS this weekend where the Bike Buyers Guide team will be taking over the main stage as well as stand D24 in the main hall. As ever, the magazine is packed with news and views on Irish motorcycling. MotoGP photographer Cormac Ryan Meenan looks ahead to the upcoming season, Roland Brown rides the all new Yamaha MT 09 Tracer and Aidan Lynam talks to the road race teams about the year ahead. In the MAG Ireland column this month, we take a look at what’s involved with volunteering with an organisation such as ours and we’ve issued an open invitation to readers to come and meet us on Stand A1 at the show. 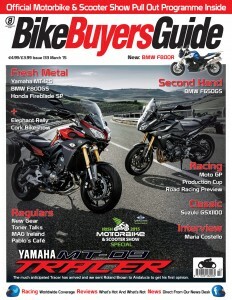 Elsewhere in the magazine, you’ll find coverage of the GSX1100 and BMW’s 650GS, regulars including New Gear, Toner Talks, Pablo’s Cafe, and of course MAG Ireland plus a competition to win a brand new motorcycle with thanks to Yamaha and Megabikes. What’s not to like?! Out now in all good newsagents.